Both of these agents can be restarted without affecting VM operation. Restarting them can be a useful step in troubleshooting if vCenter has trouble connecting to a host or if you experience HA errors. For restarting mgmt agents in ESXi, this can be done via the console menu interface, see link above. As of ESX 4.0 U2 a new tool for configuring network in the service console (COS) has been introduced. If you're not too comfortable with CLI then this might come in handy. The tool will give you a numbered menu and you can list and configure nics, vswitches, vswifs, etc. Here's a link to a VMware KB article that presents the tool. To run the tool, type console-setup in the COS. Menu entry 1, 2, and 3 will show the output of esxcfg-vswif -l, esxcfg-nics -l, and esxcfg-vswitch -l respectively. 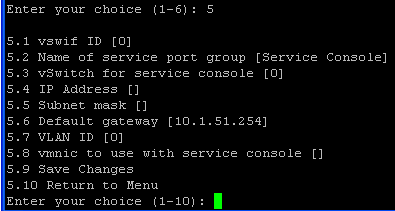 Menu entry 5 will let you configure your service console without having to remember any of the commands. Pretty neat.. Here's a link on how to do it the old school way.